Some of you may remember this painting of my Mom that was painted from a black and white photograph during WWII. My great uncle had it painted while he was stationed in England. He had brown eyes so I think the artist thought my Mom did too. However, my Mom and my Grandmother both had blue eyes. Other than the eye color, the painting is very accurate and resembles Mom, Mary Adeline. My Grandmother’s name was Adeline Pearl. 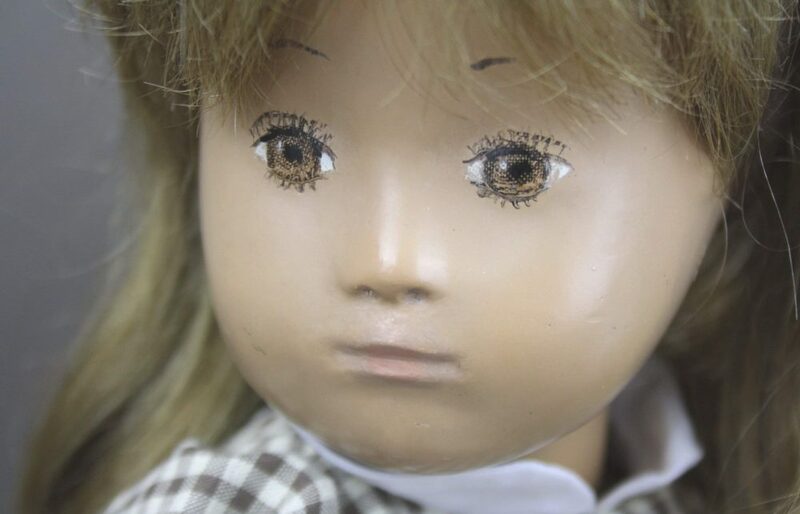 Please let me introduce a new Sasha studio doll who is named Addy after my Mom and Grandmother. Addy is an AI studio doll and I love her beautiful face and painting. She reminds me of my Mom as a young girl. Addy came wearing this sweet outfit. Addy is a tall girl of 20 inches. Addy’s wig is wool yarn and styled into nice full plaits. A few close up photos of Addy. I have loved cloth dolls all of my life and finding this beautiful girl feels like finding a treasure! Addy is standing next to her sister Abby, an AI studio doll that has lived here at Sasha Shangri-La for several years now. They are both about the same height. It is so nice to see them together. I dressed Addy in a pair of blue corduroy overalls made by Thu Cuc Faes but kept her shirt and duffle coat. Recently, Ruth of Ruth’s dolls listed several beautiful studio doll outfits for sale. I bought this pretty plaid dress with red leather belt for Addy. She is looking festive with her ornament in hand. Hello pretty Addy. I hope you have a wonderful Christmas season. Ruth included this beautiful pinafore too. What a beautiful outfit! With Sasha’s birthday just a few days ago on November 30th, I want to thank her once again for bringing such beauty into our lives. Brigitte came over to say hello to Addy and she brought her Santa ornament with her. They both want to thank you for visiting us today and for helping Addy to feel welcomed. A couple of Waterlogue images for you to see. Have a Very GOURDY Christmas!